This week I’m happy to share my Top 10 films of 2012. You can see numbers 20-11 here, and a ranked list of all the films I saw this year here, but I’m excited about the range and quality of these picks. Since last year, I’ve made my list a top 20 in order to spotlight some picks that might be a bit more eccentric or overlooked, but each year a crop of films emerge that are too good to ignore. 2012 was no exception, reinvigorating both challenging North American filmmaking as well as the international festival favorites. There’s something decidedly old-world about Terence Davies’ post-war romantic melodrama—or perhaps just decidedly British—yet far from feeling classical or staid, The Deep Blue Sea is passionate modern filmmaking at its finest. Anchored by a trio of beautifully calibrated and distinctive lead performances, the film follows the romantically starved Rachel Weisz, caught between the comfortable boredom of her aristocratic husband and an intense but unfulfilling affair with a dashing young pilot. Fear of emotional commitment was in the air in 2012 (Take This Waltz, Sleepwalk With Me, The 5-Year Engagement), but Davies alone tacked the subject with the complexity, wisdom and emotional intellegnece it demands. For all its shortcomings, or even because of them, Prometheus represents my blueprint for what a 21st century sci-fi blockbuster should be: creatively designed, visually compelling, exciting and with a genuine interest in posing big questions. Sure, Prometheus has some unfortunately clunky character writing, but the sci-fi genre has the unique ability to encapsulate metaphysical musings within broadly palatable mainstream metaphors, and I applaud Ridley Scott for pushing his sorta-prequel to Alien in that direction. We may ultimately remember it the way we fondly look back at a film like Forbidden Planet. Another lesson for aspiring pop-art blockbusters: please, have the decency not to run over 2 hours. Like Thai director Apichatpong Weerasethakul, another of my favorite new voices in international cinema, Miguel Gomes imbues his films with an intoxicating and inviting air of mystery. In his new film about love, compassion and the legacy of colonialism, there’s a sense that each passing minute could push the film anywhere, and yet each decision Gomes makes feels inevitable and somehow perfectly right. For example, Tabu hinges on a mid-film divide in which extended flashbacks—captured in the gorgeous black & white of the silent era—add nuance and new shades of meaning to the film’s setting in present-day Portugal. It’s a bold, formalist tactic, but it pays off beautifully as the film opens up before our eyes. It’s been widely noted that Amour exhibits mercy and grace not commonly associated with the work of Michael Haneke. While I agree—the love of Amour is potent and true—the film is valuable for its unflinching and brave portrayal of old age and death, issues we all experience and yet so few investigate. With the help of fearless performances by acting legends Jean-Louis Trentignant and Emmanuelle Riva, Haneke is able to show us the strength of the love that powers a lifelong partnership, within the context of the everyday indignities of old age. The couple experience good days and bad days, and it’s rare for a filmmaker to portray such a range of feeling with equal precision and sincerity. Once Upon a Time in Anatolia is a film without a center. It concerns a police search for a buried body, but we know its discovery can only lead to more questions, not answers. With crawling patience, deadpan existential humor and ravishing digital cinematography, director Nuri Bilge Ceylan transposes the barren topography of the Turkish countryside into a much more troubling emptiness of meaning in life. What makes this a great film, though, and a far less bleak one than it may seem, is the strange comfort and solace Ceylan finds in not having the answers. His characters are all searching for something (only nominally a dead body), but this search opens them up to small moments of power and beauty when they least expect it. If Wes Anderson continues to make the same film over again, as his detractors would have us believe, then why does each film exhibit a new and expanded level of emotional maturity? Anderson takes us deep within his own heavily-stylized worlds—be it the upper-class fantasy brownstones of The Royal Tenenbaums or the boyscout innocence of Moonrise Kingdom—but his gift is the generosity and truth he gives to each of his characters within this artifice. Moonrise Kingdom will be remembered for its tender portrait of young love and hope, but I prize it for the balance and depth Anderson adds by introducing strains of failure and loss in just one scene between Bill Murray and Frances McDormand. Holy Motors is the art house film for art house skeptics. Undeniably original and certifiably crazy, it’s a most welcomed breath of fresh air, and simultaneously an indication of the limitless possibilities of the future of cinema and a loving homage to its past: all its pasts. The film follows a mysterious “actor” who, over the course of a single day, inhabits the lives of at least 9 different people. While begging on street corners or performing a strange, sexual dance in a motion capture studio, the actor runs the gamut of human experience, from the ridiculous to the sublime. This range of experience, in fact, is what elevates Holy Motors beyond a mere metaphor for the power of film as storytelling. It’s not about the various characters an actor portrays, but the array of different people each of us will be over the course of a lifetime. Cosmopolis is a slow, maddening descent into the hollow center of modern America, a vain search for meaning in an age of endless, pulsating data, and a trip across town to get a haircut. In other words, Don DeLillo’s heady novel is perfect material for director David Cronenberg, who has long proven adept and unusually insightful at making our technological fetishes grotesquely literal. While Cosmopolis may not seem like it on the surface, it too details mankind in the process of a painful transformation. In today’s world of global economic meltdown and polarized class rhetoric, however, humans no longer meld with televisions or the DNA of flies, but rather with streams of information, vast, unknowable and meaningless. The final film from Hungarian auteur Bela Tarr might also be his best. Like Satantango and Werckmeister Harmonies before it, The Turin Horse features his unique brand of hypnotic, desolate black & white long takes, the strange beauty of which alone makes Tarr one of the great filmmakers. Yet The Turin Horse also affords Tarr his simplest and most effective philosophical framework, which at once compliments the raw power of his images and complicates it. The film examines the miserable daily routine that defines the lives of a poor coachman and his daughter, and, with a kind of sadistic glee, asks why we cling to survival when all hope seems to be lost. A mesmerizing experience. 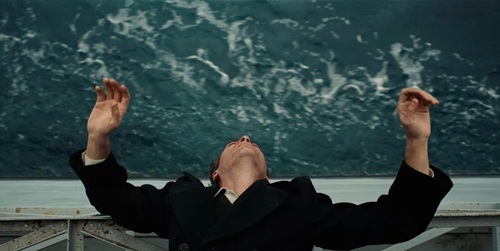 While great films come and go every year, I believe Paul Thomas Anderson’s The Master will remain an American classic precisely for the jaggedness which disrupts the conventional narrative many seek from it. Like the sharp turns of the film’s score by Jonny Greenwood or the angular boniness and physical anguish of Joaquin Phoenix, The Master is rough around the edges and difficult to approach. And yet the starling originality of storytelling and filmmaking gets under your skin and stays there, allowing the film’s many ideas to gestate and bloom differently within each viewer. To me, The Master is about souls set adrift, as so many were in America after The Great War, and as so many are today. Phoenix’s memorably troubled protagonist Freddie Quell is constantly running away from life, fearful of staying in one place too long and giving himself over to any one master. The miracle of Anderson’s film, though, is the empathy and sensitivity it shows to this inner struggle, turning it outwards and bouncing its echoes across the whole film. The Master is Anderson’s most singular, masterful and assured film, but it’s also his most compassionate. good stuff Johnzo(pro)! I’ll have to check some of these out. …Anatolia sounds cool. Seriously though, did you see Argo yet?